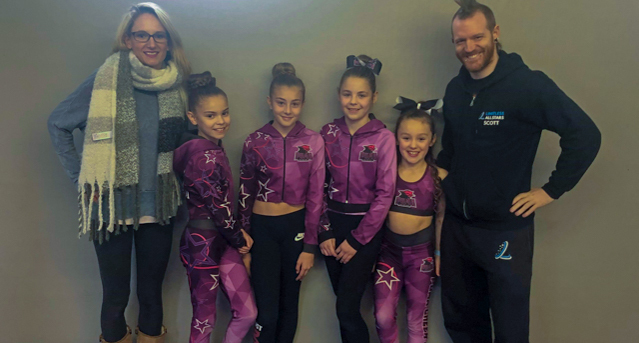 The highly successful Skelton-based ‘Puma Cheer and Dance’ group are gearing up for their first big competition of the season. Saturday and Sunday (December 1stand 2nd) sees them in Manchester for the Winter Championships under the aegis of the United Kingdom Cheerleading Association (UKCA). On the first day at the Belle Vue Sports Village in the city they will compete in the cheerleading, group stunt and partner stunt categories. Challenges in pom dance, cheer dance and urban cheer follow on Sunday. The group have qualified for the European Championships for the last two years running. If successful next weekend they would head to the national competition in March from which they would seek to qualify for the European Championships yet again. “Last year we came home from the Netherlands with gold, silver and bronze medals in various categories,” said head coach Tara Bullock: “One of the reasons for our success was that we were able to bring in an external, world-class coach who helped refine our routines. We’ve been able to do that again this year thanks to a community grant from ICL Boulby,” she added.